Virginia always liked to see my dogs when I visited her at Burien Books or when I helped her around her home on Three Tree Point. She was amazed when I pulled out my cell phone and snapped the picture. Later that day, I had one printed at Bartellâ€™s and brought the print to her store. Although she greatly enjoyed the picture, she was incredulous of technology and avoided it if at all possible. On her kitchen table, an old radio was her link to the outside world. She kept her rotary phone until it would no longer work with her supplierâ€™s phone system. She never owned a TV. At the bookstore, she didnâ€™t have a cash register or a calculator, let alone any sort of computer. She would total up your order on a scrap of paper, using a pencil, never a pen. The cash drawer is a work of art (see photo), made of wood, with dished-out coin compartments worn smooth by 50 years of use. The funny old microfiche machine was as high-tech as she would ever get, and when they stopped making new films for it, a couple years back, she did the best she could ordering books by phone. When I worked at her home, I sometimes borrowed a wonderful old screwdriver with a wooden handle, still in perfect condition and perfectly useful. The screwdriver was probably older than me. Virginia never bought anything new. She loved her garden, as did I. From the street, you canâ€™t even tell there is a house because the rhododendrons and snowberry have grown so thick. The path to her house was overgrown, creating a tunnel Virginiaâ€™s height, so I had to bend in half to walk up and down her path, which was just as it should be. Visiting her house or the bookstore seemed like a trip back in time. Iâ€™m not sure if the wisteria on her deck was holding the house up or pulling it down. I would ask for explicit instructions on how to prune her holly bushes because I knew she had a particular idea of how they should turn out. I accidentally broke a clematis vine she had trained to climb her Douglas-fir, but I quickly patched it up with some scotch tape, and the next year it was as healthy as ever, the wound no longer visible. I asked her, just last year, if she would like a hand rail for the uneven brick steps leading up to her front door. â€œOh no. No, no, no,â€ she said. Virginia Pearce preferred to use this wooden cash register over any newfangled one. The idea of using materials to build a handrail seemed way too extravagant to her. She had an Oregon grape bush that she held onto on the way up the stairs, and a cedar tree to steady herself on the way down the stairs, at 96 years old. I would clean out her gutters, the only wooden gutters I have ever seen, and then oil them, trying to get one more year of use out of them. When I would clean her windows on the north side of the house, she would give me a squeegee, a cup of water, and one paper towel. I would have approached the job with a bucket of hot water and an entire roll of paper towels, but she was right. I could get the job done with the supplies she gave me. She had a yellow rose bush at the corner of her house, and she liked to take roses cut from it to have in her house or at the bookstore. She often took cuttings from her garden and arranged them artfully at the bookstore. I didnâ€™t know Virginia as well as some other people did, but in my impression of her, I would have to say that â€œFrugalâ€ doesnâ€™t exactly capture her character. Itâ€™s true that she didnâ€™t like to spend money, and she didnâ€™t even like for me to spend money. If I came to the bookstore looking to purchase a particular book, before she would order it for me, she would ask, â€œAre you sure you wouldnâ€™t rather check it out from the library?â€ Her parsimony was not motivated by greed at all. I have zero knowledge of her finances, or how she magically kept that bookstore open for 50 years when Amazon and Barnes & Noble put most other bookstores out of business, but I feel certain that her thriftiness was not based on the desire for the accumulation of wealth. Rather, she felt that she and others could enjoy a simple thing, like a yellow rose, a finely crafted old screwdriver, a crooked little old house, or a bookstore with no computers. Who needs a TV when you can get lost in a book? She savored the simple things, like a visit from my dogs. I certainly cherished my visits with Virginia, and I will miss her. A sad note for our town. I too am more a library than a bookstore person, but I did enjoy my annual tide calendar, special greeting cards, and having Virginia order the occasional must have read like “Getting a Grip”. Virginia was a special person indeed. I bought my first book from Virginia at Burien Books, probably not too many years after she began running the store. It’s “The Silent Miaow” by Paul Gallico and I’ve kept it on my shelf BECAUSE it was my first book. 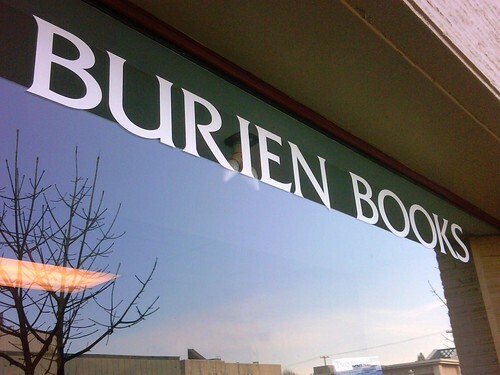 The Burien Book Store, and Virginia, are foundations in Burien. (Perhaps her wooden cash drawer insert should be in the collection of the Highline Historical Society.) She’ll be missed. Departed on Nov. 23, 2009 and resided in Burien, WA.